Tourism: Haa: Bhutan: The third Haa summer festival this year managed to draw 134 international tourists, the highest so far, since its initiation in 2011. The festival is a part of Tourism Council of Bhutan’s (TCB) effort in promoting Bhutan as a year-round tourist destination. Showcasing the traditional culture, nomadic lifestyles and unique Bhutanese cuisines, the festival was held over two days in Haa. It ended on June 5. There were around 15 tents with various products and artifacts on display. It was followed by traditional sports and religious performances, while guests took part in local sports and cultural programs. Calling it a successful event, TCB officials said the number of tourist arrivals was almost double that of the last festival. “It has hugely benefited communities in Haa and our target of promoting Bhutan as a year-round destination considering this month being a rainy and lean season,” the TCB spokesperson said. A spectator, Ap Dawpey, 84, said such initiatives helped the district, not only in terms of income, but to bring the communities together. A stall owner, Tshri Dema, 45, said, with an increase in visitors this year, she earned a good income. “Usually, our business is slow and I haven’t seen these many foreigners in Haa so far,” she said. 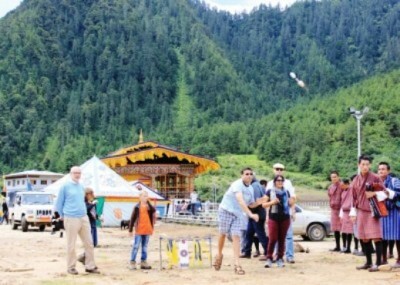 The festival was organised by TCB, in collaboration with Bhutan Olympic Committee (BOC) and Haa dzongkhag. Haa dzongda Sonam Wangdi said the festival helped bring together locals and tourists. “Besides farmers and local communities, the festival also helped hotels in Haa that enjoyed full occupancy,” dzongda Sonam Wangdi said. A major highlight of the festival was the bike marathon from Changlimthang, Thimphu to Haa via Bondey, Paro and Chelela. The participants covered a distance of about 104km. Of the 36 local and international participants, 31 completed the mountain biking race organised by BOC and Amankora. Three participants were women. In the mens’ category, an Australian volunteer teacher Tom Hornibelow, 39, came first followed by Karma, 23 from Paro and Sonam, 37, from Amankora. In the women’s’ category Reika Yoshi, 27, a Japan International Cooperation Agency (JICA) volunteer teacher came first while Kimiko Shimizu, 38, who works in JICA, Thimphu came second followed by Lise Pretorius, 27, an environmentalist with World Wildlife Fund stood third.